The philanthropic momentum of the Dr. Phillips Center for the Performing Arts continues to grow with the announcement of a new $1.5 million gift from Winter Park residents Marc and Sharon Hagle. The Hagles, who previously pledged $1 million to the project in 2007 upon its initial approval, have committed an additional $1.5 million. The gift is a testament to the Center’s massive community embrace which continues to be a hallmark of the project, garnering an unprecedented $80 million in gifts before design plans were even completed. 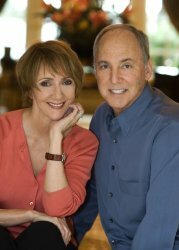 The Hagles’ new gift designates $1 million to the project’s second stage of construction – the 1,700-seat multi-form acoustic theater, designed to house the Orlando Philharmonic Orchestra and Orlando Ballet – and $500,000 to fund the Center’s endowment, specifically for programming for the Orlando Philharmonic. Marc, CEO of Maitland-based real estate development company Tricor International, and his wife Sharon are beloved in the community for their longstanding support of the arts, most notably, the Orlando Philharmonic Orchestra and the Orlando Museum of Art. “We owe a huge debt of gratitude to the Hagles for standing behind this project. We hope this serves as a catalyst for future gifts to realize the Dr. Phillips Center in its entirety,” Ramsberger concluded. This entry was posted in Classical music, Dance, Performance space and tagged Dr. P. Phillips Orlando Performing Arts Center, Jim Pugh, marc hagle, Orlando Florida, orlando philharmonic orchestra, Performing Arts, sharon hagle. Bookmark the permalink. Much thanks to the Hagles!! It feels so good to know that there is real support out there for us who want to provide amazing entertainment for this wonderful community!!! Thank you, Marc and Sharon, from the bottom of my heart! Still wish they’d think about taking all the money and spend it on making Amway Arena into two theaters – one Broadway and one for Concerts; renovate Bob Carr with a bigger lobby, better sound, better seating with aisles, escalators; build a couple of Black Box theaters in old gym at the corner and perhaps some restaurants where the tennis courts are located. You’d have 7 theaters (counting the two already in the garage) and parking for more than 1,000 cars in one block and it would be away from Amway Center. The location of the current thinking is much too close to AC and when a big show arrives with 15, 20 or more 18 wheelers waiting to unload at the limited space, the roads will be blocked for hours. We really don’t need the boondoggle of a “Creative City” right there.